← This or That Beauty Tag! I thought I’d share some awesome beauty finds I purchased this January. I have realized that I have become obsessed with nail polishes! Currently, I am searching for lots of pretty pastels for the springtime! 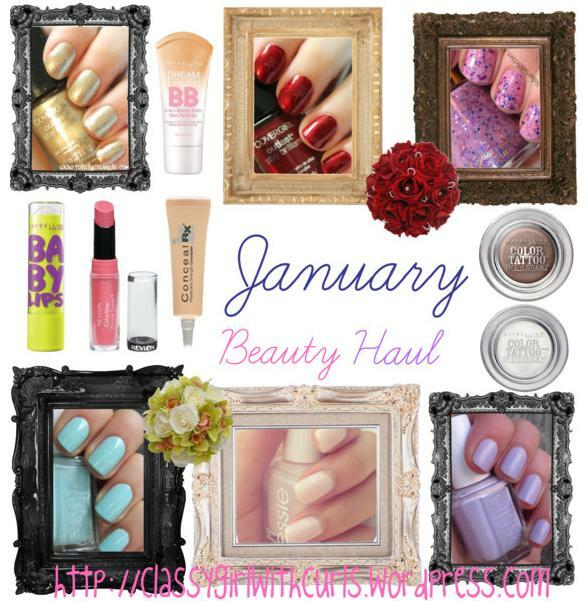 Enjoy the haul and be sure to leave a comment about what beauty products you bought this January! Like I said before, nail polishes are my new addiction. It feels weird not to have my nails painted. Therefore, I paint my nails constantly! Essie is BY FAR my favorite brand for nail polish. I really like the consistency and durability of the polishes. Also, Essie always comes out with the cutest lines! Adorable! The Revlon polish is really funky and fun! It is one of those colors that makes me smile when I wear it. Lastly, yesterday I picked up the two Covergirl Outlast polishes. To be honest, the only reason I got them was because I had a coupon that gave me $3 for two polishes (saved 30% holler). I saw these gorgeous metallics and was immediately drawn in. A total plus was that they have a built in top-coat (totally radical, I know) and look like quality dupes for the Chanel polishes. Even though they are wintertime polishes, I do plan on using them throughout February and March. Lots of my friends have Babylips products and adore them! I thought it was about time that I gave it a go and tried it for myself (conformity at it’s finest, lol). I picked peppermint because I wanted a flavor and it always leaves me with a fresh and clean feeling. It makes my lips so incredibly soft, I see why people love it so much! The Revlon lipstick is my holy grail! I’ve recently gotten really into lipsticks but my mother doesn’t approve (wahhhh). When I used this product the shade was PERFECT. My mom said, “Wow, that actually looks really nice!”. When you get your mother’s approval on lipstick, that’s when you know it’s perfection. Like most teenage girls of the 21st century, beauty gurus on YouTube have a serious impact on what we like. After seeing numerous gurus talk about these “Color Tattoos” I decided I should try it out. A little over a week ago I picked up “Bad to the Bronze”. I fell inlove with it! The creamy consistency was just right and it lasted all day long! Yesterday, I picked up “Too Cool” and was very pleased once again. The only thing is that I wish they made lots of neutrals! On YouTube one guru I watch, Ingrid, talked about how her favorite concealer was the Physicians Formula. She showed how it covered up everything. Hopeful, I purchased it thinking that it was going to be the “magic” concealer. Sadly, I was let down. Don’t get me wrong: it wasn’t horrible. It just wasn’t what I was expecting. Although, it does make a fabulous concealer for under my eyes (to cover up my sleepiness, lol). The Maybelline BBCream was a product that I wanted to try for a LONG time (since August 2012 I believe). Much like the concealer, I was let down. It is alright, it just doesn’t have great coverage. It is still good if you want to wear minimal makeup though. I totally need to make a shout out to my lovely friend Amie. She actually gifted me the Essie Nail Polish (Ballet Slippers), the Revlon polish, and the Revlon lipstick! Thanks so much! LOVE LOVE LOVE them! Mwah!